Why Do Cats Like Laptops? Why Do Cats Shake Their Tails? Why Do Cats Lick People? Why Do Cats Throw Stuff off the Table? My Cat Is Obese – How To Help Him Lose Weight? Why Are Cat’s Noses Wet? How Often Should I Feed My Cat? How Much To Feed A Cat? How To House Train A Kitten? 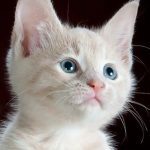 You probably read this when you are planning to bring up a cat from kitten hood or have a kitten to train already living by your side. Perhaps you even have already had a kitten living alongside you for a while, but you wonder how to make the kitten get used to you, your family members and your house. We’d like to show you how to house train a kitten so that everything will go easy for you. First I have to congratulate you with your decision to bring up a cat from kitten hood. It is great to get a new cat into your house. Kittens are just great fun. We had our cat Nusse from kitten hood. Kittens are usually adopted by the age of about 12 weeks. That is just about the time that they stop weening from their mom and start on the “normal” food. In the wild this would mean they would start to hunt or learn to at least and eat prey instead of mothers milk. In kitten hood in domestic situations this simply means we can slowly let them eat more and more kitten cat food. As they stop mother milk and start on regular food, it means they won’t either be so bound to their mom anymore and can easier be separated. House training your kitten, means generally to give them lots of love and care. Kittens simply really need a lot of love. As you are going to take the role of their mommy, you will have to provide this now. Love doesn’t mean just cuddling your kitten to bits. It also means taking care of them in every possible way and keeping them safe, while protecting them from harm. The good thing of all this love and care sharing, is that you will also grow a great bond with each other. Kittens and cats love to be cuddled. That means however that you should cuddle them when they are either asking for it or allow you to cuddle them. Never ever force cuddle them, for that will just annoy the heck out of them and might do the opposite of relationship building. Cuddle time will show itself. A lot of kittens are just full of energy and see your hand as a toy or another kitten to play with and cats play rough! Every cat is different and so it is hard to decide for you when they should be having cuddle time, but you will learn it fast enough by watching your cats behavioural patterns. Cats generally want to cuddle after another action such as after dinner or after play. This is also because the cuddle time is for when they are about to rest (before sleep). All that activity makes one tired. As I said before, every cat is super different, but in general cats like to be stroked in the direction of the hairs, not against. The top of the head from nose towards neck is a favourite spot as well as in most cases the side of the chin, right below their eyes towards the neck. The more you go towards their tail, the less likely they will like a touch of us there, although with kittens I usually end up stroking from head to tail. You should probably avoid the belly, feet, legs and tail. Also, be careful not to touch their whiskers (too much). Whiskers are super sensitive sensory devices on a cats face and it could potentially hurt them for that reason. So rather use a finger to stroke that top of the head instead of a full hand. During play time you better use toys, for otherwise you might develop a kitten into a cat that will attack feet, toes, hands and ankles. I’ve taken care of a bunch of cats that were already grown into this type of monstrous behaviour and that is not much fun. The good thing of a cat from kitten hood is that you can teach them quite a lot of good behaviour. Yes, you just became a parent! Play time is definitely a fun time, for kittens are so cute when they play, aren’t they? Toys might also depend on what type of cat you got, but I have found that tiny light and soft balls work perfectly well for a play of soccer through the room. You can easily join in on the fun and roll the ball to your cat, which might in turn roll it back to you or go completely nuts throughout the entire room. Other favourites are the laser toy and the feather or mouse on a rope with a stick. These two help in the matter that you can avoid having a claw in your fingers. Just be careful not to shine the laser in their eyes, this can be causing damage to their eyes (just as well as to your eyes). The stick with a piece of wire and some object as a feather are also an all-time favourite, for we can now let them run around and burn all that excess energy. After all that excess energy has left the body, kittens usually sudden drop and fall asleep. As if a wind-up toy had lost its energy or a battery powered toy suddenly went out of power, kittens might just drop at the spot and be gone in sleepy land. 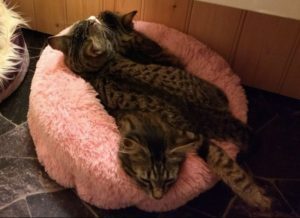 If that spot is in a dangerous place, you should move them to their dedicated sleeping place, such as a warm cat bed. As we all know, we need to be warm when we are sleeping, for our (and their) body temperature sinks upon sleeping. Sleeping time also means that kittens grow (and heal) the most. They will not just regenerate energy, but also grow a bit more. Bah.. we don’t want kittens to grow, we want them to be kittens forever!! hahaha.. of course they grow, like anyone and everything else. Cats could be asleep for many hours in the day, but for kittens it will be a matter of an hour here or a couple of minutes there. Kitten life is about play, sleep, eat, defecate, sleep, cuddle, sleep. There is time for anything, just that kittens need more of it and more often than adult cats. Adult cats can easily eat once or twice a day, while your kitten might need to eat as often as 4 to 6 times a day. They are constantly in movement or growing while sleeping and hence they burn way more. In the same time they don’t have huge stomachs so they can eat only so much every time. You can feed them dry kibble and provide water to hydrate them or you can go by the better hydrating wet kitten food. Either way it will produce different forms of the next point in this list. I would go for a mixture of 2-3 times dry food and 1 time wet food, possibly even some kitten milk that you can get from the store, until they are past their kitten hood stage at (??). When kittens (and cats) are drinking or eating, please do not disturb them. Don’t cuddle them or play them, they need their nutrients so they need to spend the time at the bowl. Always provide your cat with clean and fresh water, especially when feeding dry kibble. Depending from what situation your kitten came from, you might have to teach your kitten to go to the toilet. Also, depending on their age, they might or might not be able to clean themselves after such a visit. This is something to take into account when adopting a kitten. Generally kittens shouldn’t go out yet. Not all areas of the world are safe enough to let a cat go out at all, but for those who were thinking of doing so, at early kitten hood they should definitely stay warm and indoors. A kitten litter box is than also essential equipment. Kitten litter boxes have a lower entrance than a regular cat litter box and are also generally smaller. As for the actual toilet training, it isn’t more difficult than simply lifting your kitten into the box after for example a meal. Make sure they don’t just play in the box or start eating the pellets. While a couple of pellets in their tummy won’t mean direct harm, a whole bunch of them can cause stomach blockage. Kittens have their instinct to rely on how to do their business in this. It is in a way even better if there is any slight scent from another cat or a previous defecation in there. The pheromones (inside feces or urine) or generally the scent will help them understand that this box is meant for this type of use. Some kittens are still unable to clean themselves (this is generally an age based thing). This is because it is a mother job at early kitten hood. You might have to do the job of their mom, but rest assured you don’t need to use your tongue! A damp or wet cloth or piece of damp paper will do the job fine. As soon as it is clean, your kitten might feel “uncomfortably” wet and start grooming themselves there. That’s all there is to teaching them to do it themselves in the (near) future. Like with the latter example of cleaning after toilet usage, they also can get some lessons from you when you for example groom them with a brush. Be careful with using those big brushes on a kitten, the brushes are not meant for kittens. Instead, you can just stroke softly through their fur. Cleaning wise you can also wash your kitten with a damp cloth, especially after they got dirty. After a session on the litter box is such a good situation to give them a bit of a cleaning. When they start licking one place or another, you could point or tap on other places of their body to make them groom there. 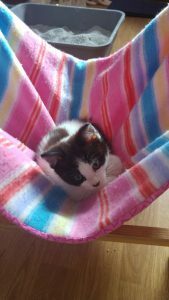 You also might have to help your kitten into their places, whether that is their own cat bed or on top of the sofa, on a chair etc. Kittens are still tiny, while they can climb very well, I see them often struggle at young age getting up on the sofa or bed (if you allow them in the bedroom). It isn’t all easy for kittens and they also deserve to be warm and cozy when resting somewhere. Above all it is your job as a “mommy” kitten-owner to protect your kitten from harm. 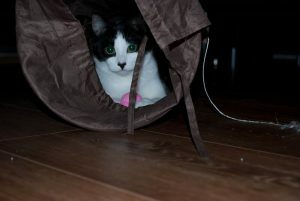 Being so small in size, also means kittens can hide or get into spaces that would be impossible for regular cats. Before taking a kitten into your home, you might have to go on your knees and look at every possible space that your kitten could get into (and possibly hurt themselves). Open nails, screws, electricity sockets, hearth places are all possible harmful places. Behind the fridge or oven and under cupboards might be hard for you to reach and easy for them to hide. The outdoor world or any opening towards can also impose danger, especially open windows, cat flaps and simply doors. We had once a feral escape a window on the second floor. She jumped along the wall of the house onto the air conditioner unit and got safely down that way. That was a regular opening, kittens can get through even smaller openings. Kittens are bound to get into places you don’t want them to get. They just love exploring and are curious about everything. You have to treat cats and kittens the same way that you would treat human babies or young kids. It doesn’t just stop at places they could get into, they are also curious about how it feels or tastes. Anything could be tasted upon, played with or thrown around. We generally have nothing on table tops that could break when it falls off. We have nothing dangerous upon ingestion lying around and will definitely try to close any opening when we get kittens to take care of. Above all, we try to keep track of our kittens at all times and ensure that they are in a safe place when we got to leave. Note that having visitors over, might also impose different reactions upon your kitten. They could suddenly act like they are feral and hide in the smallest places to feel safe. House training a kitten means also teaching the various dedicated places for them. These places are very self-explanatory, but do remember that the litter box should not be where the eat and drinking place are. These places should be strictly separated. That isn’t just because of smell or taste or hygiene, but also because cats have preferences over where there food and drink places are, where they play and where they do their toilet business. In the contrary, you might find kittens taking their toys to the food bowl. I have even encountered toys in the water bowl. The latter situation is less wished-for, as we will have to dry out or clean off toys, but it has a simple reason it happens. Play is hunt a prey, which will be taken home to eat. Home is where a cat can safely eat and sleep. No cat does their toilet business in their sleeping area, nor out and about while hunting. Marking hunting terrain and property is done only by pheromone markings through a number of methods (pheromone glands, scratching and urine/feces). A place to play has to be a safe area where your kitten or kittens can do so without getting disturbed or being in the way for others. That is off-the-ground-level and generally can warm them up (think cat beds, preferably on a raised-level such as cupboards and chairs). At some point or another you will notice that your cat will start scratching. This is partly to keep their claws top-notch sharp and partly because it is a way of spreading pheromones and claim territory with markings. You might want to (try to) avoid getting your furniture ruined and install a couple of scratching boards. Scratching boards can be attached to wall-sides and corners of sofa’s and other furniture or might stand on the floor. You will have to teach your kitten to use this place, so redirect any “bad” behaviour towards the dedicated scratching place for your kitten. If you happen to live in a place in the world where it is alright to let a cat go outdoors or you got one of these fancy outdoor catio’s, you will want to install a cat flap perhaps to let your cat enjoy the outdoors. Alternatively you will have to stay the slave and open and close doors all day long. Either way, your kitten will want to know how to ask you for this service and it shouldn’t be of the type: “I will scratch this sofa until you will listen and open that door for me!”. Another great way to separate human places and cat places, is giving your cat(s) a dedicated place for everything playing, sleeping and scratching (not eating and defecating). As such there are many solutions, from simple cat beds to large cat trees and you can build beyond and above, against walls and through them. Entire speedways for cats I have seen too. 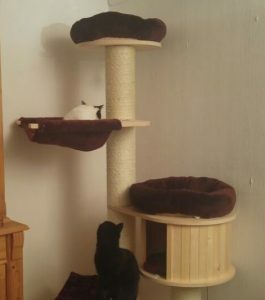 We have kept it simply with a cat tree and some cat furniture perched on different levels on our walls. As you can see, house training a kitten is going to be a bit more effort than just providing them with food and a litter box. It is going to be a lot of work to properly house train a kitten, but it will definitely be more than worth it. The bond you will create with your kitten and the amount of respect you will get for cats is an amazing life lesson and a wonderful experience to be had. If you got any questions regarding having a kitten, please feel free to contact us, either here through the website, on a comment or through our social media channels available. We are looking forward to answering your questions. Have you got any experience with a kitten? Please share your experience with kittens (or cats) in the comment section below! 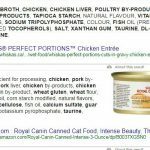 Here’s our ultimate guide to find the best cat food for indoor cats are less active as outdoor cats and have therefore a more specific need for cat food.